Hello from Scottsdale, Arizona! We’re here visiting for a little work and play. I’m so excited to be getting away for some downtime after a busy year. My mom and stepdad are arriving soon too, and Adriana is pumped to have lots of quality time with her Mimi and Papa. The last time we were here I was 6/7 weeks pregnant so it’s pretty amazing to be here with my girl this year. That trip, I could barely get off the couch due to 1st trimester nausea (I think I hiked a total of 1 mile, lol); it’ll be nice to feel normal again. I plan on making up for the last visit in many ways, especially on the food front! Any new plant-based restaurants pop up? Our trip is off to a bit of a strange start – we had a series of odd events yesterday during our trek here, and then we woke up to an earthquake (!) last night. It felt like a truck slammed into the side of our bedroom. Luckily, it wasn’t too bad (4.1-mag), but it did give us quite a scare in the middle of the night. Aka…I screamed and then said a couple choice words. I immediately checked the baby monitor and Adriana didn’t even budge! Oh to sleep like a baby. Anyway, that was quite the welcome. This hearty meal was thrown together last week and I loved it so much I knew I had to share it with you. Plus, I figured we could all use a balanced meal after the Halloween festivities. So I went with a bowl for this post, but rest assured you can also stuff this into a big soft tortilla wrap. I absolutely love burrito bowls because you can make them as simple or as complex as you want. They can be as basic as plain black beans, sliced avocado, store-bought salsa, and rice, or you can load on a wide array of toppings to your heart’s content. I tried to keep this one simple, but also included some interesting components that make it fun and unique. I hope you love it as much as we do! This burrito bowl is so filling and healthy! 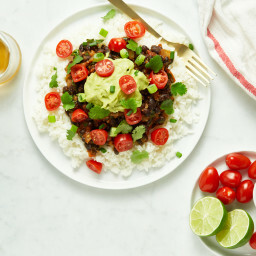 The Spicy Black Beans are adapted from one of my favourite cookbooks, Super Fresh: Super Natural, Super Vibrant Vegan Recipes by Jennifer Houston and Ruth Tal. The spicy black beans are to die for. (Or, to live for!) I love to use the beans in a wrap, sprinkled on a salad, or even as a dip with tortilla chips and guacamole. The Avocado-Lime Sauce is also a must-make. It yields about a heaping half cup so if you are a big avocado lover you can always double the recipe. To change up this recipe, stuff everything into a large soft tortilla wrap rather than enjoying it bowl style. For the rice: Add the rice and 1 tablespoon of oil or butter into a medium pot along with 2 cups of water. Increase heat to medium-high and bring to a simmer. Immediately reduce the heat to low-medium, and cover with a lid. Cook the rice until it’s tender and the water is absorbed. For white long-grain rice this will take 13 to 20 minutes, but please follow the directions on your specific package for best results. Meanwhile, prepare the Spicy Black Beans: In a large wok or skillet, add the oil and melt it over medium heat. Stir in the onion and garlic, along with a pinch of salt, and sauté for about 5 to 6 minutes, until softened. Stir in the chopped tomatoes, chili powder, garlic powder, dried oregano, cayenne (if using), and 1/2 teaspoon of salt. Continue sautéing for another 3 to 5 minutes (increasing/reducing heat if necessary), until the tomato softens. Now stir in the tomato paste and drained and rinsed black beans. Cook for a few more minutes until heated throughout. Taste and add more salt if desired. Stir in the cilantro. You can leave the mixture over low heat until ready to serve or simply turn off the heat and reheat before serving. For the Avocado-Lime Sauce: Mince the garlic clove in a mini food processor (or use a regular size processor, if necessary). Now add the avocado flesh, lime juice, water, and salt. Process until smooth. Taste and adjust lime juice if desired. I usually add another teaspoon. When the rice is ready, reheat the bean mixture, if necessary. Divide the rice between 2 to 3 bowls. 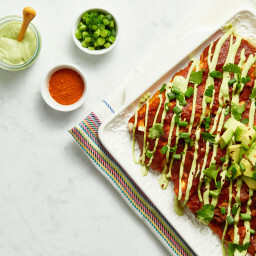 Top each with a couple scoops of the hot black bean mixture, and a large spoonful of both the salsa and the Avocado-Lime Sauce. Garnish with sliced green onion and optional sliced grape tomatoes. Serve immediately. * Why the use of refined coconut oil? Unlike virgin coconut oil, refined coconut oil doesn't have a noticeable coconut flavour. I use it whenever I don't want a coconut flavour to come through. That being said, if you don't mind a bit of coconut flavour feel free to use the virgin kind. 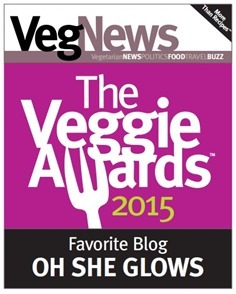 I recently heard that Oh She Glows won “Favorite Blog” in the 14th annual Veggie Awards™. Even though I never feel quite deserving of such a title given the immense talent in our plant-based community, I’m so grateful for those of you who love what I do and take the time to vote. You guys inspire me to grow and improve in so many ways! My 7-year “blogiversary” was on Halloween (seriously, I can’t believe it has been that long! ), and this blog would be nothing without YOU. My favourite part of blogging is that I’ve met so many incredible people over the years, so just know that if you’ve ever taken time to leave a comment or said hello in person, it’s not something I take lightly. Or, if you’ve made a recipe and enjoyed it with your family, even better! 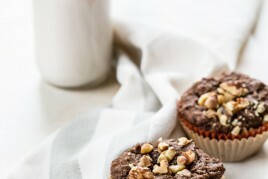 Ps – Thanks for all your reviews on the Pumpkin Gingerbread Muffins! So glad you are enjoying them. I love that I get to make all of your recipes now and it’s for work! We scarfed these bowls Friday night + loved them. Obviously drenched in nacho “cheese” sauce. The cilantro in the beans was the perfect amount for this non-cilantro lover. ;) Aaand, I never knew that long grain white rice only takes less than 20min to cook. Crazy! Loving that you guys collaborate now! Been following both of you for years! Ashley is love to know what cheese sauce recipe you used! Hi Katie! Thanks for the sweet comment! :) The cheese sauce will be in OSG cookbook 2 and it’s killer!! You’re going to love it! My husband and I are obsessed. Holy frickin crap this looks delicious. Will be attempting this this weekend! Although we live in Toronto, my partner’s family lives in Phoenix, so we visit the city often. I’m sure you’ve already tried them, but here are our favourite vegan joints in the Phoenix area are TrueFood (obvi), Green, and Nami (especially for breakfast and for their hominy side dish). Enjoy the warmth! Thanks Danielle! I totally hear you about True Food…we always get there at least twice. I think I’ve been to Green but it was years ago and don’t think I’ve heard of Nami! Will check them out for sure. I live in Phoenix and recommend checking out Pita Jungle (my favorite). There are several locations in the valley. I also enjoy the Persian Garden Café. Welcome to Arizona! Crazy you should arrive when we have three earthquakes in one night! I love your blog and have made several recipes. I work in Scottsdale and love it. Enjoy your stay! Crazy timing right? Thanks for the warm welcome :) Gorgeous weather so far! But I’m not surprised one bit. Oh my goodness, sorry to hear about the (literally) shaky start to your holiday, Ange! But I’m so glad you’re getting to enjoy some time off and see your family too. Wishing you lots of fabulous nausea-free hikes this time around! And on the whole burrito front, I’m totally on team bowl. I always end up trying to stuff too many fillings into my tortillas anyway, so whether or not I intend to, it all generally explodes and gets eaten with a fork out of a bowl anyway! Oh my, you woke up to an Earthquake, how scary for you! It’s not always fun living in Niagara Falls (the US side) because it gets so cold here but I am thankful for no earthquakes or severe weather that way. Just super cold and snowy. Your daughter is brave =) Lovely DIY bowl. The title of this post is adorable and you managed to take a cute picture of black beans. I mean, you made black beans look sweet. Ha. This bowl looks hearty and filling. Thanks. Okay, I’m seriously going to need to try this – usually when I do a burrito bowl, it’s plain rice + plain beans + various toppings and veggies, and the dressing is salsa. Because sometimes (oftentimes) I’m lazy. These look great! I was making burrito bowls last week based off a recipe my Mom used and, while hers turned out, mine were a total fail. Just plain. Looking forward to trying your recipe! Mexican is by far my favourite food style and this sound UNBELIEVABLE. I am making this bowl this week. Yum! I actually love burrito bowls. Generally I prefer corn tortillas, and corn tortillas are not particularly good for making burritos. Serving tortillas on the side is a good option, if one wishes to have them. This looks great for a casual dinner when you have people who are dairy-free and gluten-free. Maybe for our next basketball party! Yayyy, so happy you’re back to regular blogging :) LOVE all the new recipes and inspiration. The one thing I always struggle with though is avocado recipes. When I crave a recipe it seems impossible to find a good ripe one at the grocery store (they are always overripe or rotten). So I revert to buying green ones and waiting anxiously for them to ripen to finally make the recipe, praying the avocado won’t be under- or overripe again (or rotten after all, SUCH a let down). Any tips greatly appreciated!! Have a wonderful time with your family in Arizona! I read a tip a while back about selecting avocados and it has yet to fail me. Basically, you pop off the round “stem” (or whatever it’s called) near the top. If it looks brown or dark or rotten underneath, that’s a sure sign that the avocado flesh is bruised too. On the other hand, if it still looks a bit green and fresh that’s a more safe bet. If you do it a lot you’ll eventually know when it’s “perfect” – or just about close to it! Hope this helps…I use this trick sometimes but I still get a dud every now and then! These burrito bowls look fabulous! I wish I was eating on for lunch right now! So funny- I made myself a very similar lunch today and called it my diy chipotle bowl, but I used wild rice. Yours looks amazing! I echo an earlier sentiment – it’s so lovely that the blog feels like it’s back to full force – not that I begrudge you the time away. My little one is turning one in a few weeks, and I can barely manage to get myself dressed in the mornings, let alone write an entire cookbook! It really is perfect timing, I’m back to work in a few weeks, and will need lots of lunch inspiration! Hey Angela! Welcome to AZ! I love your blog and use your cookbook almost weekly!!! Can’t wait for number 2 to come out! Other idea, find Veganphx on Instagram- He is touring, snapping pictures, and gives feedback on vegan food options in the area. Great local ideas for you to check out! Lastly, for sure hit Natural Grocers if you need food or ingredients while staying here- AMAZING variety and good prices! I have big fat heart eyes for this! Definitely a bowl!! Always a bowl!!! This sounds so good! Bowls all the way for us! And lucky girl…okay, not so lucky on the earthquake – scary. Have a great vacation! We love AZ and all its wonderful variety. Be sure to check out Sphinx Dates (Phoenix) and Queen Creek Olives (south of the city & Canadian ex-pats from London, ON). Happy hiking, too. We loved rambling around the Desert Botanical Gardens and had a lot of fun doing the Pinnacle Peak trail. Thanks, this looks yummy. I am trying to reduce our meat consumption as a family, and this recipe is sure to be a winner at home. Beans and rice together are full of proteins, and this should help fill hungry stomachs. Ahhh Angela! Welcome back to the Valley! I’ve only lived here a few months but I’ve hit up a few veg friendly places … Flower Child is delish if a bit pricey. Pita Bistro is a Chipotle style lunch spot and I love the falafel bowl! Too bad you’re not book touring/etc. I would have loved to meet you! I like olives on dishes like this and, come to think of it, I don’t think I’ve ever seen olives in any of your recipes. Not a fan? My favorite “company” meal is a burrito buffet. The basic start is what you suggested. I add frajita veggies (roasted peppers and onions), roasted tofu, corn salsa (Chipotle’s recipe) with pulled pork/chicken and cheese for my omnivore friends and family. It is always a big hit. Also works well for a “pot luck” gathering: each person contributes to the buffet. Don’t be fooled by the juice part, it is way, way more that just juice. It is locally owned and the menu changes weekly based on what’s fresh. While it’s not in Scottsdale, it’s just a short little drive down 101. I’d have to say it’s even better than True Food, though because it’s not a big chain, the ambiance is different. Regardless, I think you will love it. If you are still in Scottsdale, eat at Green Restaurant. Damon is very nice! They have an amazing array of plant base food and they also have a vegan bakery next door! It’s fantastic! I use to work at the burrito bar. I use to eat burrito bowls or burrito salads, but then as work got busier I switched to burritos since they were fast to eat during breaks. Then when I quit I kept making burritos as they were easier heat and clean at my other job. I think the idea of portability is what makes me love a burrito- even if I don’t make them normally. The one I made today is a mix of leftover brown rice, chili, and a sweet potato & brussel sprout dish. I just have to mention Kale & Clover in N. Scottsdale. I wish I could eat there every day. They have meat, vegetarian and vegan. And their veg items are satisfying for everyone. Love your recipes & cookbook.! Could you add nutrient information. Calories, fiber, carbs etc. I tried this recipe last night and it was AMAZING! I have tried many of your recipes and even purchased your book and I have to say not one recipe has failed on taste. Keep up the great work and I’m looking forward to your second recipe book and vegan meal ideas. I’m so happy to hear that! Thank you for the feedback! This bowl looks delicious!! I hope you have a great time in AZ! You would love Pomegranate Cafe. It is a little drive from Scottsdale but well worth it! What is the nutritional content of this recipe? This was very yummy! Instead of the spices in the recipe, I used your 10 spice blend (http://ohsheglows.com/2014/10/02/10-spice-vegetable-soup-freezer-friendly-vegan-gluten-free/) which I already had made, and Ina Garten’s guacamole. Spicy beans, guac, brown rice, and hot sauce is all this needed to be a delicious meal. I use that 10 spice blend for just about everything, by the way. It’s magical. Looks delicious! I love, love burrito bowls. They’re my go-to quick meal. You can throw almost any veggie into the bean mixture, too– kale, peppers, summer squash, broccoli. Yum! I made this bowl and enjoyed it rice, next day milket, third day in a bun. So good! Congrats on winning the Veggie Awards Favorite Blog again! I confess, I voted for your blog through a link to the voting that was on a different blog! So glad you enjoyed this Nicole! Thanks for your feedback – I will have to try it with millet next! I made this for dinner tonight. It will be a regular at our table from now on. Wow, this is delicious! Saw the IG pic today & just had to make it. Easy too. I put mine over quinoa. Welcome to Arizona! Angela have you tried Pomegranate Cafe in Phoenix? GO TO CHOP SHOP!! Such a lovely restaurant you would love it :) or flower child, another fantastic choice! Enjoy your stay in Arizona! I live in Tempe. Like some said already definitely check out Nami for Sunday brunch or desserts and pomegranate cafe. I also recommend Iss Oatmeal Cafe and 24 Carrots if you’re in the Tempe/Mesa area. Congratulations on winning the veggie award! You deserve it! :) & it sounds awful with the earth quake – I am glad you are all okay! & the burrito bowl looks really good!! Tried it with a touch of smoked paprika in the beans, it was delicious. Hi Angela, my wife and I have been making your recipes for years and have loved pretty much everything we’ve made. For this recipe, did you really mean 2 tablespoons of freshly grated ginger? When we made it, eating it that night we thought it was really ginger-y. Then again, eating the leftovers the next day, it tasted great… So, maybe it was spot on? For us, if we are eating it the same night we cook it, we’d cut the ginger in half, but maybe we’re just ginger sensitive? Thanks again for all the amazing recipes. We can’t wait for the new cookbook to come out! Hi David, Thanks so much for your kind words about my recipes! I’m a bit confused because this comment is left on the DIY Burrito Bowl and there is no ginger in the recipe. :) Did you mean another one? Woops… My bad. 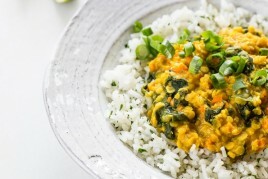 I was flipping between the dal recipe from last week and your new post, and I posted on the wrong recipe! Sorry! Hi Angela – I didn’t see anyone recommend Fresh Mint. It’s by the Scottsdale airpark and it’s amazing! Love your blog! This really reminds me of the burrito bowls at Chipotle and I’ve always wanted to try to recreate one. Now I have a recipe to follow! :) Also, I must say that I’m really enjoying Ashley’s photography. She’s so talented! How do you get the photographer to take the gorgeous photos of your cooking if she lives in the States?! I’m so curious! Oh my gosh, this was so delicious. My 5 and 2 year old sod great with this as well. They are a bit picky, so this was a big win. And really it was better and easier than burritos. This recipe is seriously tasty (am eating it right now!). I have young twins and this is my first dinner for 3 nights. What a great way to break my [unintentional] fast! Gorgeous photos and I don’t think I have ever seen any burrito look so beautiful. Love the vibrancy of that yummy avocado cream. I have found a new dinner time favourite! After making this last night, I was stunned by the flavour and how wonderfully hearty it is! YUM!! So thrilled to add this to my list of top notch dinners!! Thanks for sharing!! This looks absolutely delicious! I’ve been meaning to try cauliflower rice for a while and this looks like the perfect dish for it. Thanks for sharing! Hi Angela! I am a long time blog follower of yours and I wanted to congratulate you with all my heart on your veggie award!!! You more than deserve it for all of your amazing recipes. I wanted to make a request for a recipe or recipes for you to do. 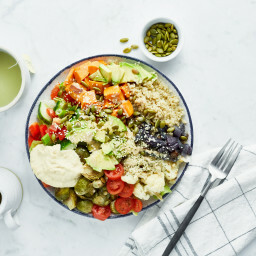 I’ve been really into veggie bowls and Buddha bowls and your lemon tahini sauce is my go to for basically everything, salads, bowls, etc.. Could you channel your magical recipe creating powers to come up with more veggie bowl sauces? I stumbled upon a food blog and you tube channel called sweet potato soul and she had two but they came from a jar. If you haven’t checked her blog out yet look into it and make her sweet potato falafel, it will change your life Thanks Angela!!! I have to say, I am absolutely in love with your recipes and your blog. I look forward to Friday nights when I spend time creating my shopping list for the week’s lunch and dinner by finding a new recipe on your website. 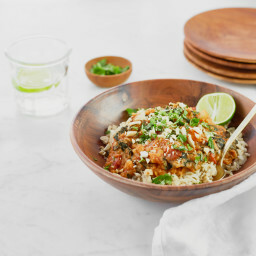 I have tried every recipe you’ve posted for the last few weeks and every one is full of flavor, helps my body feel energized and is very filling (I recently decided to go vegetarian and was concerned about not feeling full). Thank you for your dedication in finding healthy, fulfilling, delicious, and beautiful looking food! I am impressed with the creativity you demonstrate with the ingredients every week. 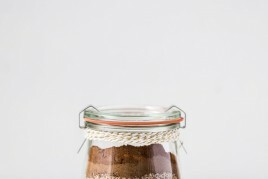 I was wondering- have you had any thoughts about posting nutritional information with each recipe? For example, I’d love to know how much protein I’m getting in each serving just in case I need to adjust and add more. Just curious. Thanks again for your persistent dedication to healthy eating and for making me feel like an amazing cook! We had this for supper tonight and it was soooo good! Thank you! I can hardly wait to have the leftovers for lunch tomorrow too. 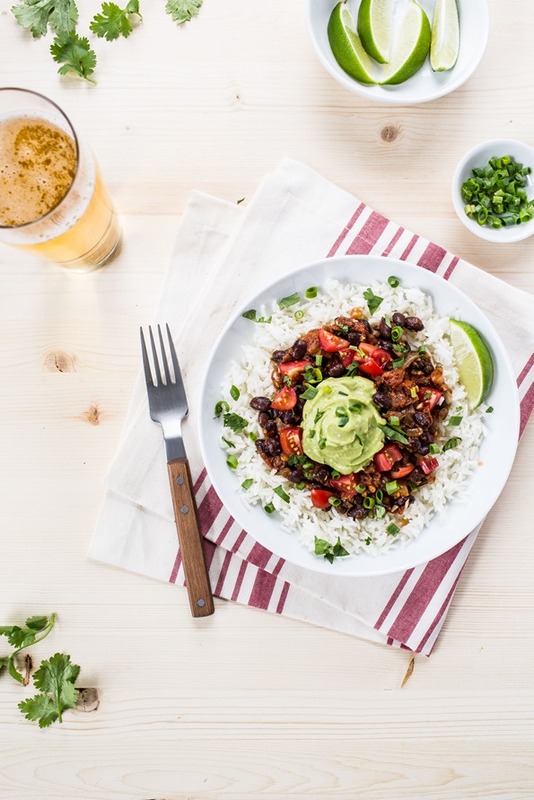 I almost took a pass on this bowl, thinking that I’ve made very similar black bean burrito bowls hundreds of times, but I am so glad I took a second look and made it last night. You always manage to create recipes standouts – no matter how seemingly simple and basic. This was so, so yummy! It will is bound to be in regular rotation all winter long – a great, super quick to prep. recipe winner. Angela – you are one in a very select group of recipe developers that never disappoints and for that, I am grateful! I tripled this so we would have lunch for a few days. But my 16 year old son came home with 5 friends and it was gone in 10 minutes. They loved and devoured it. My sisters and I loved it!!!! Thank you so much for giving us acces to all theses recipes for free. I bought your book and I use it almost everyday. I gave one to my cousin….. Such a great book. Very good week supper! Ntoo many ingredients and done quite quickly a good thing cause I was starving!! i’m eating it as I type this. I just put half the cayenne pepper for a test, as my boyfriend is very sensitive regarding spicy food. it’sperfect for me, although i’ll do it without cayenne for him. lime-avocado sauce adds freshness to the plate. it’s one to keep! thanks! I’m new to the meatless world and loving it. This recipe tastes fabulous, was easy to prepare and very filling. I’m learning how to cook meals that don’t revolve around a piece of meat and recipes like this make it so much easier. Thank you so much! You just took burrito bowls to a whole new level! This was a huge hit with the whole extended family, which includes vegans, omnivores, pescetarians, and an 11-month-old baby. Your blog and cookbook have been my go-to’s since I became vegan almost 3 years ago (at the age of 52–better late than never! ), and your recipes never let me down. Thank you for sharing your gifts and talents with the rest of us! I almost didn’t make this because I throw together similar bowls quite often, but I’m so glad I tried it! You have a way with elevating simple dishes and flavors. My husband and I both loved it and will definitely come back to it again. Thank you Angela!!! Will the avocado cream last – I like to meal prep on Sunday for the week? Looks fantastic by the way! I’ve visited your blog in the past, but forget to do that on a regular basis! I have your cookbook, which is BEAUTIFUL, and was wondering do you have a possible publish date for the second cookbook??? Looking forward to that one. Thank You. Thank you so much. The second cookbook should be out in early Fall 2016. Just made this- what a hit! I used quinoa instead of rice, and added your nacho cheese sauce, and it was incredible!! Could not be more obsessed with your blog. Oh wow this looks delicious while at the same time easy enough for a kitchen newbie like myself to whip up. Can’t wait to try this out and convert one my favourite meals into a vegan healthy alternative! I tried this last weekend, and it was brilliant!! One of the best recipes for this type of thing I have found. I passed it one to practically all my friends and they have said it was great as well! Bulls Eye hit on this one!! Our book club has been reading Ditching The Drive Thru by Natalie Winch, and we go out and buy ingredients for her recipes, cook them up and try them at each meeting, they are fantastic and this recipe fits right in! Her book is so good, a lot of ideas for Farm Fresh options which in my opinion are the best options out there! Hi, i have a question… If i use regular black beans (not canned), soak them overnight cook them and then follow the rest of the recipe would that work? And what would be the correct amount of pre-cooked beans? Thnx… Great blog!!! Have just made this…..it’s fantastic! I am a vegetarian that tries to eat as little extra animal product as possible (dairy, eggs, etc) and my family are big meat eaters!! However, I made this for them last night and they all loved it! It was delicious and easy to prepare. Thank you for the recipe. Made this last night with a few tweaks: replaced the avocado because I loath it (sadly!) 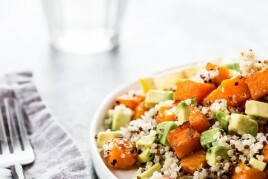 with a salsa (as suggested by another reviewer) and ate it over quinoa – it was delicious! Thank you – very simple but very yummy. Beautiful place!! The pics are perfect and white dress too! I just made this! Very yummy. It’s the perfect right-before-thanksgiving-clean-out-the-fridge-meal!! Awesome, and it makes 3 generous servings. Yummy, will definitely repeat this. We tried it out last night and it was amazing! The black beans are incredible. It was the perfect meal for a cold night, and the easy prep made it all the better. I’m a vegan but your recipes are the only ones my meat-eating partner will not only eat but also loves, so thank you! Nice photos! Love it so much. This looks amazing! Can’t wait to try , grocery store here I come! Love your recipe’s.. Almost your all recipes i have tried. Wow, this recipe is incredible! I definitely suggest doubling or tripling the recipe because it is so tasty. Thank you! I can’t wait to make it again soon! What a great idea to mix all that goodness with the black beans! I love mixing black beans and corn (given they’re complementary proteins) and rice! Almost like a homemade Chipotle bowl. Looks super tasty, especially the avocado sauce! do you ever give nutritional info for those watching/counting carbohydrates. Thank you for sharing, it’s delicious!!! Any suggestions for black bean substitutions? I have an allergy to black, kidney and lima beans. I love this recipie! instead of chili powder though I put in one chipotle pepper for extra smoke. I also added coriander and cumin to the beans for extra flavor. This was a great recipe, thank you for sharing. I added organic canned corn to the mix, just to give it some more veggie. I think in the future I would half the garlic i put into the avocado sauce, and I may not use tomato paste next time. I thought it was too tomato-y. Trying the avocado past a tonight! Oh my goodness!!!! I just made the DIY Burrito Bowl and as I’m sitting here eating it I can’t believe I actually made it!!! It taste like something that came out of a restaurant! I’m so impressed and I absolutely love all the recipes on here!!! You go girlfriend!!! I’ve made this a few times and its SO good. I usually add more spice (I like things very well seasoned) and add a can of green chilies (or since fresh store bought tomatoes are gross this time of year, I do a can of tomatoes with chilies). Oh and some frozen corn niblets too, right at the end. I CANNOT wait until sweet corn is ready next summer so I can make it with fresh tomatoes, fresh peppers and fresh corn. OMG, drooling. Its great with the vegan sour cream (from the chili page), too. YUM. I made this last night and it was delicious! I added cubed tofu right after sauteing the onions for extra protein (Wildwood is the best brand, it’s firm and you don’t need to press the water out like most tofu which saves time). I didn’t have a ripe avocado so instead I used fresh salsa from the farmers market. Turned out delish! Definitely a keeper. this was soooo good! Even my 11 yr old who is picky said it was the best burrito bowl he has tried. I love your blog/space. Keep the recipes coming! Delicious! I made this for lunches this week – easy to make, pretty cheap and perfect for summer. YUM. Have you ever considered using avocado oil instead of coconut oil? It’s super good for you and it tastes AMAZING! It’s great for cooking but also amazing in dressings as it doesn’t have the bitterness of olive oil. I get mine at Costco. Yum! I’d love to try this on a sweet potato… Sweet potato burritos are the best! Made this today and it was delicious! The whole family loved it! Thank you! Great recipe! Made more than once. I use brown rice. The burrito bowl has become a favorite for my husband and I! We have made this for dinner numerous times since I found it! Thank you for all of your amazing recipes! I made this last week and it was a huge success – including with two picky preschoolers! I will definitely be making this again. Thank you! I’m 71 and have been a vegetarian most of my life. Your recipes are incredible. I made this recipe, following it to the letter, and it was so delicious. Thanks so much! Hi Ginger, I’m so happy to hear the burrito bowl was a hit! Thanks so much for the sweet comment. Loved this meal! So did my whole family, including two picky toddlers – a keeper for sure! I’m so happy to hear it was a hit with everyone, Sarah! Any recommendations for adding veggies to this dish? Angela, you are awesome. We made this bowl last week and are doing it again this week. I couldn’t believe how fast i put it together and was done in 20 minutes! We loved it! EVEN THE KIDS! Thanks for a great, hearty, delicious recipe once again! I made these burrito bowls and they were soooo good. My eyes are really sensitive to onions so I was tearing up the whole time from the onions. But this recipe was really pushed up with the avocado lime sauce. mmmmm…… so DELICIOUS! Love this recipe!!! Family Favorite. Small Changes: We use 1 can of FireRoasted Tomatoes (time saver and adds a hint of flavor) & 1 cup of Frozen Roasted Corn (from Trader Joe’s) and stretches the recipe to feed all 4 of us. And sometimes we actually roll it into an actual Burrito Wrap. DELISH!!! Thanks for the great suggestions, Isabelle! I’m so happy you and your fam have been enjoying the recipe. Tried your DIY Burrito bowl for dinner tonight. Wow! My husband and I loved it. We will be making it again. I’m so glad it was a hit, Searcy! Amazing! So simple and incredibly delicious. I added vegan garlic mayo and Vegusto vegan cheese for extra joy. My burrito bowl turned out extremely spicy – I think I had some especially vicious chili powder and cayenne – so next time I will tone down the spices a little, but otherwise this was great. Thanks so much! This is delicious! thank you! I have a ridiculous amount of pimentos in my fridge so I added it to the avocado sauce, freaking awesome. Keep it up! Hi Denisa, I hope you love it! OMG i made this tonight and it was super delicious. My boyfriend went back for seconds and thirds…darn, he took my lunch. Yummy!!! This was to die for! I made it on a lazy night when all I wanted to do was lay on the couch. I made it spur of the moment and ended up having all the ingredients! The recipe was so simple and all my coworkers were jealous when I brought the leftovers to work the next day! Tried this tonight and it was SO good! I added chopped romaine lettuce and it gave it some nice color and great crunch. I think I might add a bit of corn next time. But the flavor of the beans was awesome. I think corn would be a great addition, Kathryn! Just made this today. It’s delicious, cheap, and comes together quickly. I did not have fresh tomatoes so I used canned diced tomatoes (drained), and used homemade pinto beans instead of black beans. It will be a regular at our home. Made this for a potluck. I always like trying out new recipes for a crowd, plus ensure that I will have something to eat (since I’m a vegetarian with food restrictions I don’t rely on others for food). Let’s just say we were all happy… And full! Only thing I can’t figure out is why it took me so long to make – 1-1/2 hours! Anyone have any tips for speedier cilantro washing? Thanks so much for the awesome comment, Emilie. I’m glad you enjoyed it!! Great recipe! I was craving Taco Bell but wanted something healthy and found this recipe. I was out of chili powder so I used a pinch of crushed red pepper and some grated fresh hot pepper, and left out the tomato paste as I forgot to buy it – though I bet that makes it even better :D Served with plain avocado instead of avocado sauce simply because I was lazy, and squeezed fresh lemon over everything. Thanks for this recipe. So glad this satisfied the craving, Rebecca! I just made this and it was amazing! I’d rather have this than going to a burrito restaurant! This was one of the best burrito bowls I’ve ever had!! Thanks, Paige – I’m so happy you enjoyed it! I made this tonight. It was really tasty! The avocado-lime sauce was a great topper. All the flavors blended so well together. I will definitely make this, again! I served it on a bed of greens. So lovely to hear you enjoyed it, Kim! Can anyone tell me what “sweet onion” is (in Australian English)? Also, can you use fresh garlic and fresh oregano, instead of powdered and dried? Thanks in advance. Looks delicious! I made the spicy black beans as specified in the recipe. 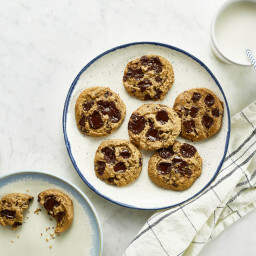 They were delicious and loved by the entire family! I think that our burrito bowls were better than Chipotles. I am a meat lover. But this this recipe is amazing. I am not missing meat at all. Yummy. Thanks. Made your DIY Burrito Bowl tonight. It was a winner – very good! Thank you for the recipe! Glad to hear it was a hit, Sue! Wow! I just made this tonight, so good!!! Is the bean mixture something I can freeze? This is hubby’s firm favourite dinner at the moment. We use brown basmati rice, the optional cherry tomatoes, and also some corn chips. A big squeeze of lime juice makes it perfect. The first time I made it I thought I needed more beans (for 4 serves), so did double the amount the second time, but think I’ll go back to the recommended amount as it drowned out the other flavours with double the beans. Because they are soooooo full of flavour. My husband and I are new to vegan eating….changing our diet in an effort to try and help my husband overcome a lot of inflamation created by Lyme disease. This recipe is the BOMB! The flavors and textures are fantastic and you never miss meat or cheese. Thank you! Hi there Susan, I’m so happy to hear you both enjoyed this recipe! Sending you a ton of well wishes; I hope this change in diet helps your husband’s health!! Forgot to rate this recipe….it is a twelve out of ten! but will give it five stars. Omg! Just made these bowls for the first time tonight…unbelievably amazing! 😍 I added some roasted sweet potato into the bowl and all the flavors together were so delicious. I doubled the recipe to make leftovers for my partner and I tomorrow. The beans are definitely the best part, and the avocado sauce is SO good. Thank you for this recipe! Hey Denise, I’m so happy the burrito bowls were such a hit! Good call on doubling the recipe…it doesn’t last long! Oh I can relate so much when you wrote “It feels miraculous to serve a meal that all three of us enjoy.” I find that such a challenge too (mainly for my 3 year old…hehe). I’m so glad this one was such a hit Andrea. Hey Amber, I’m so glad you loved it so much! I’m sorry I don’t have the nutritional info for this recipe. I make this recipe almost anytime I want to get back to cooking. It’s always at the top of my list. It’s easy! I’ve made many different mistakes and have cooked the onions and tomatoes all different levels of done-ness and it always turns out great! I omit the cayenne. If I’m feeling lazy, I just slice avocado on top. Won’t lie, sour cream is really awesome with this dish. I also love peach and pineapple salsas on top. Dipping chips into the dish is also a winner! Thanks so much for this recipe! This is a really good recipe. Allthough I would recommend to double or even triple the amount here. I made this for 5 people (guys) and I made 12 servings and I wish I had made a little bit more. Maybe its because its soo delicious ;) Anyways a little tip! Hey Eivind, I’d totally agree with making more for a crowd…good tip for sure. I’m so glad you loved it! So Good! I made it just as the recipe was written at first and it was so good! My chili is remarkably hot/spicy (got it at a great Indian spice shop) so the next time I made it, I used less for my less adventuresome friends who still wanted to keep their taste buds. Easy to make and so tasty. I’m too lazy to puree the avocados so now I just dice them fine and squish with a fork – my friends and I like slight chunky guacamole. I let people put their own cilantro on since not everyone likes it. This is my go to simple dish and it is a full meal in itself.